Genuine Turquoise, Spiny Oyster Shell, Gaspeite, Black Jade and Blue Lapis inlaid between ribbons of Sterling Silver with Fire and Ice Lab Opal Accents. 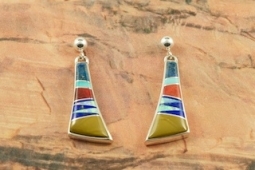 Stunning Sterling Silver Post Earrings feature precision channel inlay. Designed by Navajo Artist Calvin Begay. Signed by the artist.